Mark Fenster. 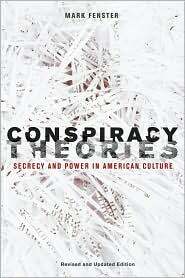 Conspiracy Theories: Secrecy and Power in American Culture (revised and updated edition). Minneapolis: University of Minnesota Press, 2008. 400 pp. Was 9/11 an inside job? Stickers declaring so can be found on stop signs and utility poles in urban centres throughout North America. And many of them are new: I recently watched a young, well-dressed gentleman plastering such stickers around downtown Montréal. The fine print includes an address for a website belonging to the talk show host and conspiracy theorist Alex Jones; articles on the site detail such abuses of power as TV mind control, the police state, the flu vaccine, the coming "food wars," and of course the events that purportedly took place on 9/11. But Alex Jones and his protégés make up only one piece of a larger group that calls itself "The 9/11 Truth Movement," and its adherents are far more diverse than our stereotypes in Hollywood and on TV would suggest. It seems that conspiracy theory is not just about tinfoil hats and Fox Mulder wannabes anymore. Mark Fenster's Conspiracy Theories argues that it never really was. Fenster, a law professor at the University of Florida, positions himself squarely in the cultural studies tradition with respect to the hoary debate over ideology and "false consciousness." He is intrigued by, and at times sympathetic to, conspiracy theories that deal in "fact" (e.g. 9/11, or the Kennedy assassination, or the Contra-crack connection) and fiction (such as The Da Vinci Code), but this book is not about proving or debunking any alleged conspiracy; rather, it sets out to explain why people believe conspiracy theories in the first place, and why those who dismiss them out of hand are missing an important part of the picture. If conspiracy theorists are not merely kooks and nutjobs after all, and we take them seriously as at least an expression of protest, what do they tell us? The book begins with a survey and critique of the predominant scholarship dismissive of conspiracy theories and theorists, and here focuses heavily on the work of Richard Hofstadter and Chip Berlet. Arguing against Hofstadter, who maintains that conspiracy theories are fundamentally pathological (in contrast to the normative consensus understanding of historical events), is relatively straightforward. Mainstream interpretations of events can prove pathological as well; so why should we consider conspiracy theory any more pathological than the consensus view? Fenster chooses a slightly different tack: some conspiracy theories might indeed be pathological, he argues, but that doesn't make it a rule. Not all conspiracy theories are as detrimental to society as, for example, the one about Israel warning all the Jews in the World Trade Center to stay home prior to the 9/11 attacks. Berlet's position is more problematic to dislodge; he argues that conspiracy theories tend to be quite a bit more fascist than consensus interpretations. Fenster simply disagrees: if there is any necessary political affinity to these theories, he doesn't see it. He tries instead to conceptualize conspiracy theory outside of designations of Left and Right, suggesting that either can utilize it as they see fit. What all conspiracy theories have in common, he argues, is populism, and the whole thrust of the book is a hermeneutics of conspiracy theory in which there is a consistent populist logic: a critique of power that is, if not a correct interpretation of historical events, nevertheless an "historical and perhaps necessary" part of capitalist democracy. He does not address the question of why some populist movements invoke conspiracy theory and others do not, nor why many communities of conspiracy theorists hardly constitute social movements at all (whether or not they are self-styled as such, as in "The 9/11 Truth Movement"). Instead, Fenster simply identifies what he calls the populist impulse behind any conspiracy theory: the government, the media and the "experts" all represent a dangerous, totalitarian "other" that is quite separate from "the people". In this account, it is only with "the people" that positivism and common sense are challenged and politics, economics, and history appear connected, even if only through shadowy conspiracies. If conspiracy theories long for anything, they long for transparent democracy. In Birmingham School terms, this is the "truth" behind the "false consciousness" of conspiracy theory. But it is a strange dichotomy Fenster draws between this anti-positivist populism and everybody else—who apparently accept uncritically the consensus view of the world and of major events. By equating conspiracy theory with populism, Fenster tries to argue that any critique of the former is really anti-populism in disguise; this is unconvincing. To assert that Berlet and others on the Left are dismissive of conspiracy theories because they don't trust the masses is to overlook the real historical uses to which conspiracy theories have been put. Certainly the Left-wing critics' dismissals of the concerns of conspiracy theorists, without trying to understand what people get out of participating, might be too abrupt, but the dangers they perceive in the theories may nevertheless be quite real. The subjects of analysis in Fenster’s book veer from militias to fiction and film and then back to shadowy politics, millenialist movements, and finally the theories surrounding the 9/11 attacks. On the whole, this works: Fenster is looking for the commonalities behind all of these theories, and how conspiracy theories in politics and in cultural practice inform each other. He pays particular attention to the elements of play and pleasure associated with conspiracy theory—and the "rush" that its proponents get out of trying to unravel the plot, whether of the Kennedy assassination or the X-Files. New to this edition are the chapter on The 9/11 Truth Movement and the Afterword, in which Fenster's tone shifts to one of greater scepticism as he addresses some explicit uses of conspiracy theory by the Right (via The Turner Diaries) and the Left (via John Fiske). The thread holding all of this together is Fenster's insistence that no matter what else it is, conspiracy theory is always a critique of the social order and at the very least an expression of resistance. Of course, if conspiracy theory indeed has no necessary political alignment, one could expect to find an historical event—any event—in which it contributed in some way not only to fascism (as it did with the spread of secret societies and anti-Semitism in Europe at the beginning of the twentieth century) but also to freedom, equality, and liberation. Yet, while revolutionary movements have frequently acted in conspiratorial ways, that is quite different from conspiracy theory itself promoting a hegemonic or counter-hegemonic discourse that propels the Left forward. Actual conspiracies of all political stripes, from the Gunpowder Plot to the Bolshevik Revolution to the terrorist attacks on 9/11, either happen or are thwarted; it is difficult to perceive how a belief in the conscious and surreptitious ongoing exertion of power by a cabal of conspirators, or in the systematic erasure of the truth of an event, can successfully interface with a social movement of the Left. The best example on which Fenster can draw is Fiske's insistence that various conspiracy theories circulating among some African-Americans—such as the theory that HIV/AIDS was developed as a genocidal weapon against black men—constitute important "counterknowledge" that might provoke a political opening. This seems to be where the progressive promise of conspiracy theory would lie, but Fenster notes (rightly) that racist and anti-Semitic tracts such as The Turner Diaries also provide counterknowledge, and so one is still left having to distinguish between the two. Of course, if counterknowledge is important for progressive politics, one might ask why we need conspiracy theories to generate it in the first place; certainly it can come from plenty of other sources as well. The book does not address this. Fenster concludes the book by noting how conspiracy theories and their longing for a better world typically fail, by not providing a way to make the leap from narrative to praxis. Certainly that rings true of the Left. If only it were as true for the Right. Justin Paulson is Assistant Professor of Sociology and Political Economy at Carleton University, in Ottawa, Canada. He researches social movements and radical imagination.